GetFlashMemory posted an article the other day about the world’s first wireless memory card. I was very excited to hear about this technology and recently found a review of the Eye-Fi product. Eye-Fi is the world’s first wireless memory card. This means the flash memory not only stores data but has the ability to transmit the data via WiFi to another host system. What you are looking at is an IBM hard disk from 20 years ago which holds 1GB of data. Notice the top left, that’s a 1GB flash memory card. So we did flips for the open source Neo1973, now we’ve got a simplified software platform. Trolltech has introduced the Qtopia Phone Edition for the Neo1973. Toshiba, like SanDisk, found a grand jury subpoena in their mail late last week. The allegations are related to flash memory NAND price fixing. The probe comes from the highest level and considering the purchase of M-Systems by SanDisk along with the other big hitter of flash memory makers is Samsung, it’s very possible flash memory price fixing could have taken place. Gizmodo did a fun little pictorial about relative size of a SDHC card last week. This is what the new Toshiba 32GB SDHC card looks like when compared to the more common 1GB SDHC card. Good thing technology doesn’t work this way. I’d have one hell of a big cell phone just to accommodate more memory – then again, I don’t think I’ll need 32GB of data on my phone anytime soon. focus on storage solutions for industrial and commercial use PCs/Systems. Its initial capital is for PQI 40% and TDK 60%. Strip away the USB connector, slap on some plastic with IDE pins and create yourself an 8GB IDE flash drive. With the recent announcement from The CompactFlash Association (CFA) to develop an SATA interface for CF memory is another positive sign that solid state memory for laptops and computers will become the normal. Despite the fact of Mr. Shigeto, chairman of the CFA board, indicates this move is to further solidify CompactFlash memory as the primary memory storage for non-consumer, embedded and single board products, I think the writing is on the wall for gaining a larger market share of the PC market. Update: More info here The other day (literally) a fellow blogger and I where talking about why cell phones are so damn proprietary and if someone could develop a phone with the same open-source mindset as say WordPress (this blogging platform) than our world would be much better off. Well apparently I’ve been living under a rock. 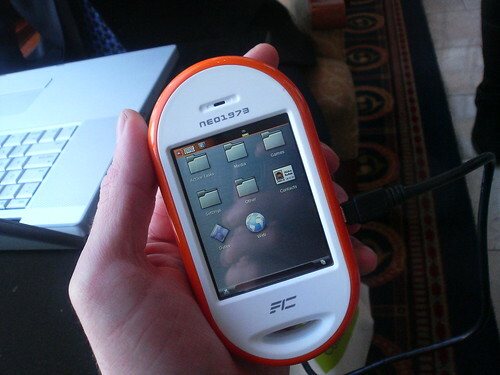 From OpenMoko comes the Neo 1973 open-source cell phone based off the Linux kernel. We selected chips that have complete documentation publicly available, such as the ARM-based Samsung S3C2410 SOC. We added a debug port with complete access to JTAG and a serial console. This phone is designed for open-source development.